Aitzaz Hasan, 15, was standing with fellow students outside his school last week in Ibrahimzai, a region of Hangu in north-western Pakistan. They noticed a man approaching wearing a vest laden with explosives. They knew what was about to happen. There were over 2000 children at the school,and Aitzaz told his friends that someone needed to stop the suicide bomber from getting close enough to harm them. According to witnesses, Aitzaz approached the terrorist, confronted him, and tackled him to keep him from getting any closer. The suicide bomber detonated his vest, killing himself and the brave boy. This is by far the shortest biography of any of the Ethics Heroes enshrined here in the Ethics Alarms Heroes Hall of Honor. It is far from the least impressive. This young man, whose life had barely begun, made the ultimate sacrifice to save the lives of others. No one of any age should have to face the choice Aitzaz had; no one should ever have to grow up under conditions that would impose such an ethical challenge on anyone. Yet when the crisis arose, this young man had the courage and values to do what all nations honor soldiers and other heroes for doing to preserve civilization and human life through the centuries: he faced the challenge, put the lives of others before his own, fixed the problem, ended the threat, and died. My mind is sometimes pulled to unexpected places when I cannot find the words to adequately describe something so remarkable. This time I suddenly recalled a speech from a film that inspired me as a boy of 10, John Wayne’s reverent tribute to the Alamo legend. The film’s many flaws, historical and aesthetic, are undeniable, but I love it even now (I watched the movie again last week, for the first time in decades), as an unapologetic bow to every American, and every human being, who has given up life for a cause they believed in. I think it might be a good idea to make certain our children know about the brief but inspiring life of Aitzaz Hasan. When they are complaining about homework, or lousy cafeteria food, or mean teachers, or bullying on Facebook, they should reflect on the challenges he faced, and that so many school children around the world face every day, that render our children’s typical grievances trivial. And we should try to make sure that they remember, as Houston’s fictional speech urged future Texans to remember, that all of us live in a human civilization that must constantly battle the influences of chaos and evil, and that each of us is duty bound to develop the values and character so we will be be ready to do our part to protect that civilization if the time comes, and to know when that time has come. 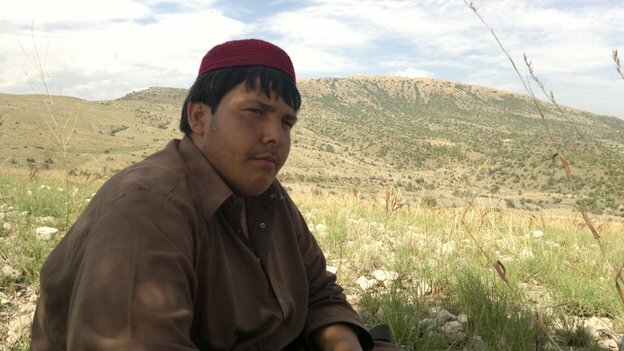 When the time came for Aitzaz Hasan, as young as he was, he was ready. It is far from the least impressive. I would submit it was one of, if not the, most impressive. I wouldn’t argue. The story moved me to tears. That’s the kind of courage that wins the Medal of Honor. Too much comes to mind on this one, but thank you for posting it. This is an example of courage that I think is beyond the ken of most Americans. Heart-rending, and should make all of us think about how lucky (Obama administration notwithstanding) we are in the US. Right now about a third of the world is on fire, while we have the luxury of navel-gazing and going on and on about school bullying, federally-inspired school cafeteria diets, the amount of sugar kids intake, etc. The early American Colonials died for the freedoms we have — one of which is to discuss openly both the crucial and the mundane with protection from the Constitution; millions of American soldiers (e.g., WWi and WWII) died to preserve our own freedom and freedom for those off our shores, and continue to do so. We have NO IDEA what people in the Middle East, China, parts of Africa face every day. Blame Obama for unemployment, struggle to make your household budget, but (and I don’t want to hear about Sandy Hook, thank you) realize that we do not live every day in fear (unless we want to), that though terrorism has occurred here, we DO NOT live every day wondering if some ideologue terrorist will make it our last day on earth. We do not have to depend on the courage of a 15-year-old to save 2,000 lives. On a combined philosophical/practical note. Why should we care about what’s happening elsewhere in the world, and why spend money on it? Answer: Beyond the basic freedom to live, every great scientific advance, every great work of art, every beautiful piece of literature, every thoughtful and enlightening work that explores the human psyche and condition, has come from people who either had the TIME or the PROTECTION to focus on their science, their art, their view of humanity. From ancient times through the Renaissance and to today. None of these can occur when people must fight to stay alive on a daily basis, eat rocks to fill their bellies, and live in fear on a 24 hour-a-day basis. Selfishly, as human beings, have we considered what might come out of the Pakistans, Afghanistans, Irans, etc., if the populations there and elsewhere had both the time and the protection to create, investigate, and think beyond simply staying alive? PS Earlier today I was bitching about the fact that certain house cleaning had not been done, and that one of the sidelights at our front door had burned out and I didn’t have the right bulb to replace it. Didn’t want only one light light on only one side of the front door — “symmetry” being one of my things, you see. I am ashamed. And rightfully so. Unless you have a plan that *successfully* installs Classically Liberal Republics, a system of Free Markets, establishment of Western style due process and belief in the sanctity of the individual, as well as a solid belief in the sanctity of property, and ensure those beliefs are held by the individuals themselves with respect for each other, then I think we’ll have to be content with a certain level of indifference. Didn’t say I had a plan, don’t really expect great scientific/artistic advances to come immediately from a free Syria, e.g.. Was just waxing philosophical, and realize full well that much of the world is still living in the dark ages and even the US is populated by morons, but I don’t think there’s anything wrong in thinking/hoping that among those suffering under intolerable conditions may be a couple of geniuses that could change the world for the better. No plan, just a hope. So, no plan. But the US an (almost now) world power should feel some responsibility to assist the masses of people elsewhere in dire need of help. We go nuts when a cruise ship is marooned and people are living on board in sewage, we fight for animal rights (with which I agree), we bemoan but do nothing about the current state of the public school system here, but it is a different thing entirely when young American men and women put their lives at risk for other countries. I understand that. Completely. And I know we have chosen our wars — many of them very badly and for unethical reasons; but we HAVE led “good” wars — e.g., liberated Europe in WWII (though the French still hate and disdain us…on one documentary a woman bitched that at Normandy her home was damaged! ), when we all know that the French would be speaking German right now (or Russian) if it wasn’t for the US. Go to Belgium and Luxembourg, Holland: they consider the US their hero liberators. Cultural differences from more than 50 years ago; cultural differences that exist now. So no, I don’t have a plan. I wish I did. But I do say that we are no longer in a position to consider the North American continent and the US immune from the havoc occurring elsewhere. And, back to the philosophical side of things, it’s like the US legal system credo: better that ten guilty men go free than one innocent go to jail. So in that part of my post I was focusing on the one, two, ten potential geniuses who could help the world if he/she only had the opportunity, time, and protection to use that genius, instead of suffering under the yoke of insane, sadistic leadership in other countries. This is dreaming, I know (and do NOT quote John Lennon back at me). But to me it’s one, just one, rationale for us to care about what’s going on in the rest of the world. We can’t save everyone, we can’t let the whole world immigrate to the US (tho they might want to), but can we occasionally go beyond the pragmatic and think about what our freedoms have meant — to us and the rest of the world. Later… an example, on NASA, the space program, and its impact on science, medicine, miniaturization and computer chips, etc. It all started there, and the world has been changed ever since. I think it might be a good idea to make certain our children know about the brief but inspiring life of Aitzaz Hasan. When they are complaining about homework, or lousy cafeteria food, or mean teachers, or bullying on Facebook, they should reflect on the challenges he faced, and that so many school children around the world face every day, that render our children’s typical grievances trivial. Unlike the Texas recruits being told about time they were being bought, that’s as monstrously manipulative a non sequitur as telling them to remember the starving children in China. There is no place for guilt trips where there is no guilt. Since there was no suggestion of guilt at all in what I neither intended nor wrote, I think your critique is misconceived. The classic guilting of well-fed children is an inapt comparison that uses a false cause and effect ploy where there is none. That’s irrelevant to the topic here, though the superficial similarity did occur to me as I wrote. I was writing about perspective, which is something else entirely and very different. Our children, those in the more fortunate soecio-economic strata certainly, have no idea what real tragedy, strife, fear and want are, and it is wise for us to teach them, and to give them a sense of the real challenges they may have to rise to in the future. Guilt is not involved, nor did I suggest that it was. As with Houston/Boone, the implication is that what is called for on behalf of the beneficiaries of heroes are gratitude, and comprehension of what real travail is. Sorry, but your misconception is not my error. Complaining about having to do homework? Assuming that the complainer is serious, I see cause for guilt. If a sense of perspective is a virtue, then a complete lack thereof is a vice, too. Maybe not a lot of guilt, mind, but enough to recognize that an error was made. The popular “first world problems” meme may be intended as funny, but it’s a bit o a corrective, too. My terrific, kind and courageous son often complained about homework, and I never reminded him that his parents rescued him from the hell of an impoverished orphanage in a miserable, burned out city in Russia, where his prospects of an education and a promising future were close to nil. But I was sure tempted. If you feel guilt, in this case, it’s not given it’s self imposed. If you fail to feel awe and appreciation for Aitziz Hazan’s courageous act and resent the mention of it as a guilt trip you have some self-examination to do. If his sacrifice doesn’t inspire a desire to live your life well and be thankful, but instead inspired resentment and guilt you might be correct in feeling guilty, but the telling of the story isn’t the cause of it. I don’t think so, not in this case. Do we teach children about Anne Frank to make them feel guilty? Please spare a thought for the suicide bomber (name unknown). He was also either possibly islamicised young, or mentally deficient or easily led or stupid or under duress – and/or culpably murderous in a stupid, misled, deficient manner. I think it is not sweet or noble for Aitziz to die in a good cause, any cause. Self sacrifice is a rotten job that sometines has to be done – and often shouldn’t be done. Two brave boys are dead who should have been friends. It’s a sad and pitiable waste that we should have avoided. Now spare a thought for those who set up the suicide bomber to attack a school. And another thought for the calculating ruthlessness of accepting (and forgetting) the collateral damage done in a drone strike. And a further one for those who praise Aitziz as a martyr to be admired and emulated rather than a victim of circumstance and systematic unpreparedness – a fate to be pitied and avoided. I submit that acts of violence are preferred by clever, driven, ruthless, old men. So brave, stupid, young men are useful to them. It is too easy to fall into a trap where we follow a big goal and ignore the interests of the young by glorifying the dead. I don’t feel guilty, just motivated. To make young men clever. “I am not stupid, I am not expendable, and I am not going.” (to do and die).. And to make old men wise and merciful (mostly me, myself – some chance). Eloquent, thought-provoking, but ultimately, silly and naive. You are allowed, of course, to rail against the inequities and foolishness of violence until the cows come home, but the facts don’t change and won’t change. Aitziz could have thrown back his shoulders, bravely said “No! I will not become a participant in this mindless pageant of gore!” and, I guess, thrilled you by allowing a few hundred of his friends go up in chunks on principle? Clever boy. Ethics requires trying to make the world as good as it can be, without being fatuous about it. There will always be toxic cultures, intractable hate, incurable sociopaths, mad-dog killers and brutal, ambitious villains, and yes, stopping them from getting the upper hand frequently requires good people, even children, getting their hands dirty, or bloody, or blown off. Those who sit on the sidelines and sneer at them should feel guilty. An act like Aitziz’s shows the right values and priorities in a permanently imperfect world, and anyone who can’t understand that it is noble (but hardly sweet) needs to splurge on a dictionary, and the sooner the better. Thank you and no, but yes. (you misunderstand me from a previous post perhaps?). Where a criminal threatens use of lethal force,pre-emptive lethal self defence and lethal mutual defence is proportionate and justified, if necessary. It’s only those last two words that are the divide between us, I suspect, in principle. Where we differ on this is the practical ethics. On what is naive and what is wise in the circumstances. Here I’m saying it takes more than the virtue of great courage to deal with Pakistan. That’s a criticism of Pakistan if anything, not of Aitziz. Bad Madrassas, Taliban, drones, corrrupt cops, Secret Service assassins, organised crime – Aitziz and his freinds may have a lot to deal with. Here’s the nub: I would have Aitziz a coward rather than a potential bomb. Because, Tex, once the Taliban et al get their hooks into someone there will be no hint of morality in turning them into a bomber. Threat/violence to family and use of mentally disabled included. Aitziz included. Given the willingness of a young man to die for a good cause, it takes only isolation in a bad madrassa, and grooming as I understand it. Discretion over valour, skepticism over idealism, humility over pride in Pakistan, is the wise path for the instruction of children, I think. I would have western children understand that, how a great virtue can be betrayed and perverted by liars, rather than read further about Aitziz in the local cultural framework of glorious child martyrs, which I regard as perverse. For grownups and old people it’s different. High ideals and noble causes are skeptically examined by people who have had time to learn that they really are mortal. But the kids should default to self preservation. And I’m still sad, and determined. Big apology, Consistent misnaming. Aitziz = Aitzaz (akak Aitezaz) Hasan. I refuse to feel pity for Aitziz’s final moments. Sorrow, yes, and awe, and respect, and even envy- I don’t want that choice, but I don’t know if I could do what he did, and I am a bit envious of the strength of character it took to do it. But pity? No. He went out with his boots on, squared off against evil. Pity trivializes that. Pity would have been for the victims had the bomber completed his mission, for helpless children murdered. Aitziz was no child, not at the end- he should have been, but he was robbed of his childhood. Instead of cowering, he grabbed an adult choice with both hands and laid himself down for others. Don’t dismiss it with pity. He was more adult than a lot of people twice or thrice his age. Agreed. It’s still a tragedy. He will be remembered with honor because he made it much less of a tragedy than it would have been. The flaw in the reasoning that “people can blame their circumstances/upbringing for their conduct” is that inevitably everyone gets to blame everyone who came before them and then those who get blame may then just point to those before them… And on and on. It is folly. Regardless of how your upbringing influences how you interact with the world, sense it and project yourself on it, your behavior is your own. The suicide bomber has no one to blame but himself for his behavior, regardless of how skewed his upbringing was or how likely that upbringing may have made him a candidate for mass murder. For that cause We decreed for the Children of Israel that whosoever killeth a human being for other than manslaughter or corruption in the earth, it shall be as if he had killed all mankind, and whoso saveth the life of one, it shall be as if he had saved the life of all mankind. I think quoting the full version of John 15:13 would have been appropriate for the bravery displayed by this young man; not the abridged lead in that you attempt to tie with the Koran 5:32 piece, which can be wildly interpreted on one extreme as allowance for self-defense killing and on the other as allowance for revenge killings. Lawful executions are not revenge killings. An interpretation in the middle of the spectrum perhaps. But I read no establishment of legal punishment in that, not with the term “whosoever”. Not just his friends. Two thousand people in the school? He put his life on the line for a lot of strangers too. I would hope that this would also remind people that true bravery knows no flag, religion , country or race. Jack, I’m reminded of another movie quote. From Michael Caine’s grossly inaccurate “Zulu”. Before getting to the quote, I’ll clarify that Zulu is horribly inaccurate but entertaining nonetheless. It is full of tired cliches and stereotypes that Hollywood is known for, but has the occasional gem of truth to be discerned from it. PVT Thomas Cole: Why is it us? Why us? Colour Sergeant Bourne: Because we’re here, lad. Nobody else. Just us. The nature of duty to your fellow man sometimes boils down to that, and regardless of the odds or the seemingly unlikely chance of stopping the evil, you have to try because sometimes you are the only one there. I really like the movie, though. Don’t get me wrong, it is one of my favorites as well. This is so sad, what an amazing young man. In another news story, I read that the reason he was outside at the time was as a punishment for being tardy. Somehow that makes it hit harder to me- this wasn’t some young paragon of virtue. He was a high schooler, who cut a class to screw off with his buddies or overslept because he was up too late the night before. He wasn’t an unattainable ideal of perfection, but just another person, who did one incredible, indelible, selfless thing. Granted, being tardy is definitely not the equivalent of hardened criminality, but the same grievance can be held by a teenager against “the man”. But he transcended and stifled pride and self service. We do wrong to make idols of heroes. To learn from their examples we must understand that they are attainable examples, not golden statues who have nothing in common with us. I feel rotten discussing anything other than his choice and its merit, but this is an ethics discussion blog. What would we think in the hypothetical case that the bomber’s vest had been mis-wired and failed to go off? Young Hasan’s act would have been precisely the same act and precisely as heroic. Would we even have heard of it? Would we remember to praise it as highly? If not, isn’t that a failure on our part? Oh, clearly getting killed makes all the difference. If the Mexicans had simply marched around the Alamo, the Texans would have been just as brave, but nobody would remember the Alamo. With heroism and sacrifice, moral luck is everything. This is especially true regarding the Medal of Honor. Few people ever get an opportunity to do something that would merit it. Fewer still live long enough to physically receive it. Would the alternative of praising and recognising good intent rather than consequence have to be implied consistently? For example would crimes of ignorance or negligence (say carrying explosives while under hypnosis/been forcibly drugged/having been groomed/being a child/being a dupe/other) be judged by the intent or the bdy count? If you run a red light do you get equal punishment no matter whether you kill someone or not? Neither position seems quite satisfactory. Do you ever do re-run posts?